Cambridge celebrates 50th anniversary with flagship Edge hi-fi range | What Hi-Fi? The new three-strong component range comprises the Edge A integrated amplifier (£4500), Edge NQ streamer (£3500) and Edge W power amplifier (£2500). While the British hi-fi company has, of late, been raising its profile in the 4K Blu-ray player, soundbase and wireless speaker sectors, it's been fairly quiet on the hi-fi side since the launch of the CX series. And now we know why. Cue the all-singing-all-dancing Edge hi-fi range. Cambridge Audio’s mission with Edge is simple: to make the best-sounding products it can. What better way to mark a half-century? “We removed all limitations during development of Edge – anything goes so long as it’s in pursuit of the best system we’ve ever made. The results speak for themselves,” says Cambridge Audio’s managing director Stuart George. The Edge range – named after Professor Gordon Edge, one of Cambridge’s founders and inventor of its first product, the P40 integrated amplifier – has been three years in the making and was supposedly created with a ‘listen first, measure second’ ethos. Performance trumps considerations about price, specs and measurements. In order to meet the sonic benchmark, a number of engineering initiatives have been made across the series. The signal path has been kept short to reduce interference - just 14 components (as opposed to two or three times that, more typically) feature in the signal path of the Edge W power amp. Class XA amplification technology offers Class A sonic performance but is more efficient, shifting the crossover point out of audible range. Cambridge Audio has refined its toroidal mains transformers further by coming up with a clever design that cancels out any electromagnetic interference generated. And to help reduce distortion, Cambridge has replaced conventional capacitors with an active circuit that gets rid of DC. For the Edge NQ, Cambridge has also updated its StreamMagic streaming platform (the foundation of its CXN and Azur 851N network players), offering built-in AirPlay, Spotify Connect and Chromecast, as well as Bluetooth aptX HD, which brings 24bit hi-res audio to offline wireless music. The Edge NQ also has coaxial and optical (24bit/96kHz), USB (32bit/384kHz and DSD256) and aptX HD Bluetooth – as does the Edge A. Both the Edge A and Edge W deliver 100 watts of power into 8 Ohms. We had an ear- and eye-full of the Edge products just before Christmas, and are looking forward to repeating the experience in our test rooms soon. As always, watch this space. 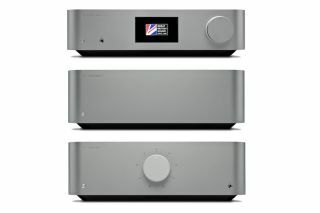 The Edge A integrated amplifier (£4500), Edge NQ streamer (£3500) and Edge W power amplifier (£2500) will be available from June - although visitors to the Munich High-End Show in May can get an early taster.